The GeoHECRAS user interface has several features that will be examined in detail in the following sections. 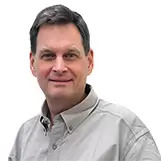 The user interface is one of the most important parts of any program because it determines how easily you can make the program do what you want. A powerful program with a poorly defined user interface has little value. The design of the user interface in GeoHECRAS uses current state-of-the-art constructs. The ribbon menu is designed to help you quickly find the commands that you need to complete a task. Commands are organized in logical groups, which are collected together under tabs. Each tab relates to a type of activity, such as entering input data or viewing analysis output. Each tab is organized into a series of panels, which are labeled by task. The Quick Access Toolbar provides a way to put the commands and buttons that you use most often within easy reach. By default, the Quick Access Toolbar appears above the ribbon on the application title bar. However, users can chose to move it below the ribbon. The File menu (sometimes called the Application menu ) provides access to file-related commands. For example, it provides commands to create, open, save, archive, and recover a project. In addition, other application-based commands are listed within the File menu. Selecting these commands will display backstage pages where settings and other options can be configured. For example, the Options backstage page allows the user to define settings that the software should use (e.g., Confirm deletions, etc.). The backstage pages (sometimes called backstage views ) are accessed by clicking on the File tab. 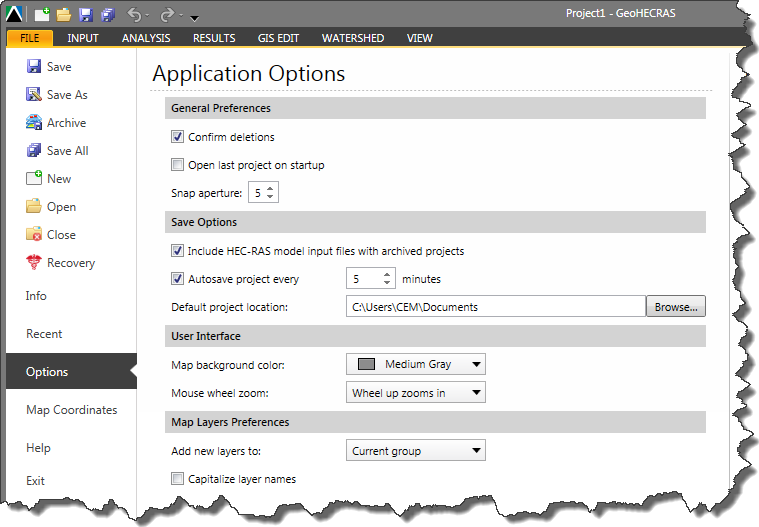 The backstage pages are used for providing access to the application settings and options as well as the current project options and settings. 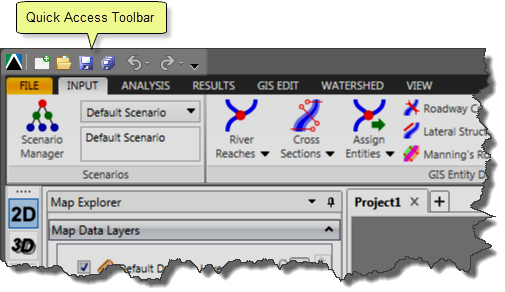 While the ribbon menu is the primary access point for the program commands, many commands are also available from context menus that are displayed when you right-click on the Map Data Layers panel or on the Map View. The contents of the displayed context menu changes based upon what the user is pointing at or if a command is already active. 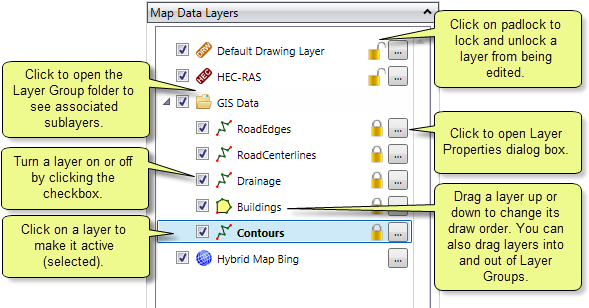 The Map Data Layers panel lists all the layers in the Map View and shows what the features in each layer represent. 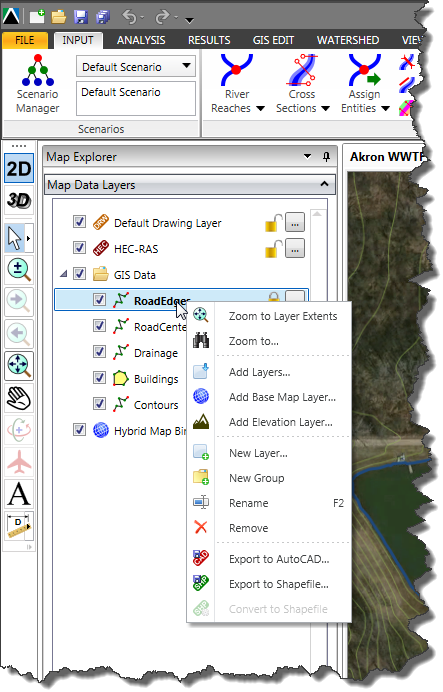 The Map Data Layers panel helps you manage the display order of map layers and symbol assignment, as well as set the display and other properties of each layer. The layers at the top of the Map Data Layers panel draw on top of those below them. 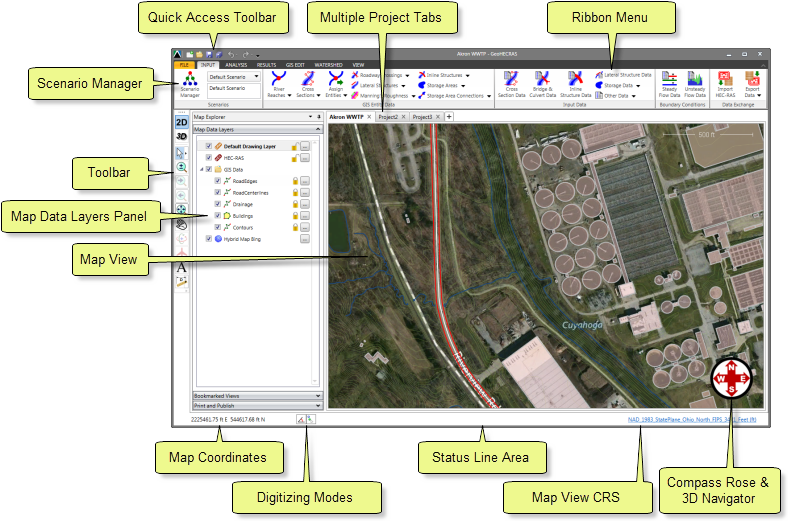 Therefore, layers that form the background of the project site, like an aerial image, should be placed near the bottom of the Map Data Layers panel and layers which should overlay the aerial image should be placed near the top. A typical project might have an image or a terrain base (such as shaded relief or elevation contours) near the bottom. Next, comes base map polygon data, followed by polyline and point data near the top. And finally, on top of everything, is the HEC‑RAS data layer and the default drawing layer. A layer can be moved up and down within the list of layers by clicking and dragging the layer. Use the checkbox to the left of each layer to turn it on or off. To change the display properties for a layer, click on the […] Properties button. The corresponding properties dialog box will be displayed. To lock a layer to prevent it from being edited or moved, click on the padlock. Click again on the padlock to unlock the layer. Click on a layer to make it selected (or active). 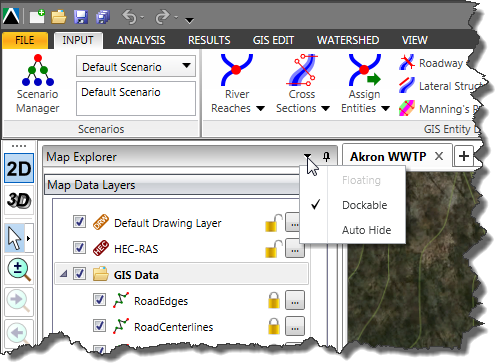 The Map Data Layers panel is docked to the left side of the Map View by default, but can be set to auto hide. Click on the dropdown arrow on the right side of the title bar and select the desired docking behavior. The Map View is the project’s main display area. The software has a multiple document interface (MDI) which allows more than one project to be opened at the same time. 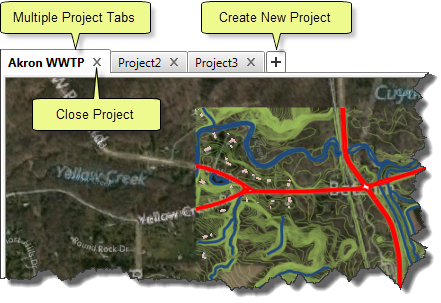 The user can easily switch between different projects using the tabs on top of the Map View. 2D/3D – Switches the Map View from 2D to 3D view mode. Select – Select elements, as well as other related commands like Edit Vertices, Select Window, Select Window Crossing, Select Polygon Window, Select Polygon Crossing. Zoom – Dynamically zoom on the Map View. Hold down the [Shift] key to zoom back. The mouse roller wheel can be used to zoom in and out, and holding down the roller wheel can be used to pan around. Navigate Backward – Similar to zoom (above) allows the user to step backwards Backward, but steps forward. Zoom Extents – Zooms to the extents of the current layer. Pan – Dynamically pan around the Map View. Holding down the mouse roller wheel does the same. Rotate View – Used to rotate the view within the Map View while in 3D view mode. Free Look Camera – Used to rotate the view both horizontally and vertically from the current location to see to the left and right as well as above and below. Add Label – Adds a text label on the default drawing layer or the current drawing layer. 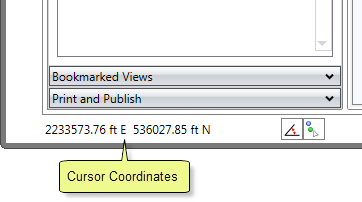 Measure Distance – Used to measure distances and areas on the Map View. The lower left corner of the application shows the cursor’s current map coordinates. The status line is located at the bottom of the application, and displays status messages during commands. For example, while measuring distances in the Map View, the measurement results are displayed on the status line. The Map View CRS (coordinate reference system) is shown at the bottom right of the application. Clicking on the Map View CRS will cause the Map Coordinates backstage page to be displayed. 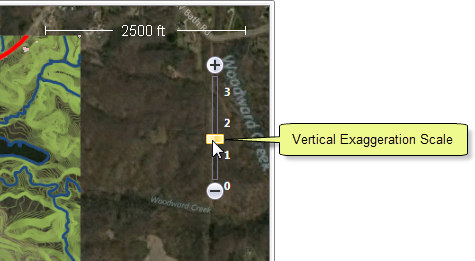 While in 3D view mode, the Vertical Exaggeration Scale allows the user to adjust the amount of vertical exaggeration of the terrain surface to show 3D surface relief on the Map View. Placing the cursor over the scale causes the scale to become more visible.